Deer tend to sneak into your garden during the dead of night and munch away happily on the results of your hard work: your flowers or vegetables. Keeping deer out of your garden can be challenging in part because of their height -- their noses aren't close to the ground like rabbits, for example -- and ability to jump obstacles. Blood meal provides a temporary organic repellant that also feeds your plants. Often chosen as an organic fertilizer option, blood meal is made from cow or pig blood. The blood is dried and smells slightly earthy. It breaks down easily, and its main purpose is to add nitrogen to the soil quickly when applied as a fertilizer. Deer don't like the smell, and it can help keep them out of your garden. 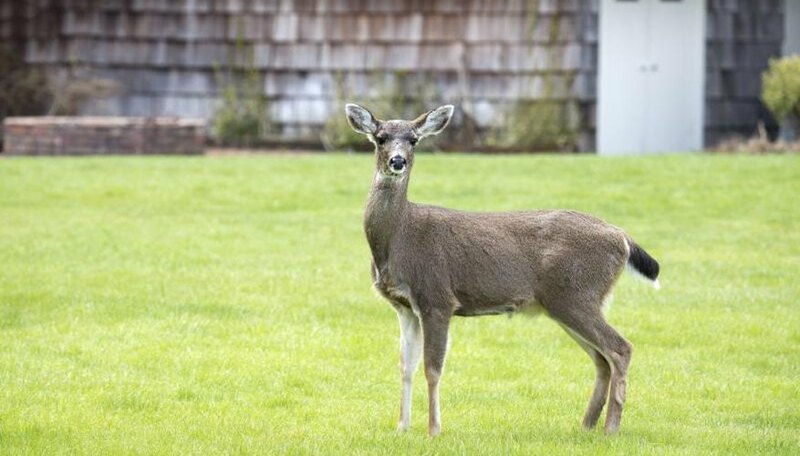 A couple of options help you keep deer out of your garden using blood meal. Spread the dry blood meal around your plants at the rate of 3 1/3 pounds per 1,000 square feet. Keep the blood meal off the leaves because it can burn them. This method typically works only until it rains or you water your garden; after the blood meal soaks into the soil, it's less effective as a deer repellant. As an alternative, pour 1/2 to 1 cup of blood meal into cheesecloth or nylon stockings and tie the tops securely. Hanging the blood meal packages from large plants or nearby trees helps keep the deer away from your garden. Blood meal, with a 15-1-1 NPK rating, adds a significant amount of nitrogen to the soil. This can harm some plants, so using the hanging method to deter deer is often better for your garden. To use blood meal as a fertilizer and deer deterrent at the same time, choose plants that enjoy big nitrogen boosts, such as members of the Brassica oleracea family including broccoli (Brassica oleracea var. botrytis) or cabbage (Brassica oleracea var. capitata), which grow as annuals. Blood meal loses its scent potency quickly, in as little as a few days, so you must replace it often. Being difficult to repel, some deer might still make it into your garden while you're using the blood meal. It often attracts other animals such as dogs. If dogs eat the substance, it can be toxic to them. Ingesting blood meal can lead to symptoms such as nausea, diarrhea and bloody vomit and can lead to pancreatitis. Take your pet to the vet immediately if you think the animal ate blood meal. Missouri Botanical Garden: Brassica Oleracea (Capitata Group) "Frigga"